Surah At-Tur - The Mount - Exegesis of 52nd Chapter of Holy Quran ~ Islam My Ultimate Decision . 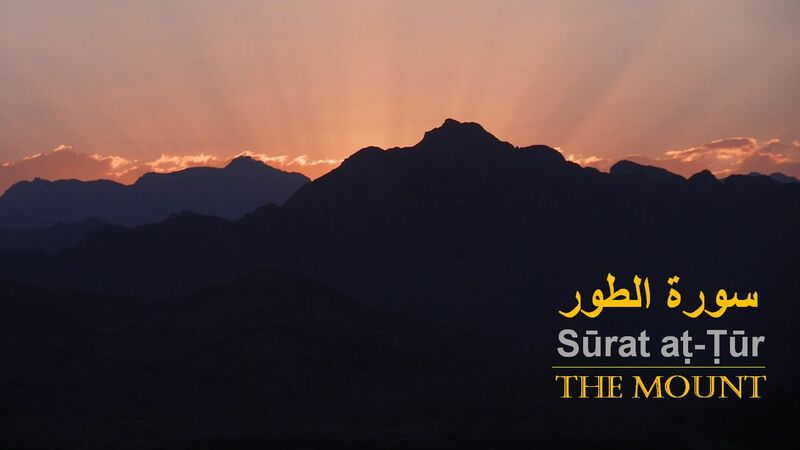 Sūrat aṭ-Ṭūr is the 52nd surah with 49 ayahs with two rukus, part of the 27th Juzʼ of the Holy Qur'an. The surah opens with the oath of Allah Almighty swearing by the Mount of Sinai, where the Torah was revealed to Prophet Musa (Moses, peace be upon him). It takes its name from "Wat Tur. (The Mount Tūr) mentioned in the very first Ayah. This surah appears to have been revealed at time when Surah Ad-Dhariyat was revealed in Makkah. I t was the time when the Prophet of Allah was facing acute objections and accusations from the pagans of Makkah. However, there is no evidence yet to show that severe persecution of the Muslims had started. The subject matter of its first section (verses 1-28) is the Hereafter. As arguments for its possibility, necessity and occurrence had already been given in Surah Adh-Dhariyat, these have not been repeated here. However, swearing an oath by some realities and signs which testify to the Hereafter, it has been stated most emphatically that it will surely come to pass, and none has the power to prevent its occurrence. Then, it has been stated as to what will be the fate of those who deny it when it actually occurs, and how will those who believe in it and adopt the way of piety and righteousness accordingly, be blessed by Allah. In ancient times the books and writings which were meant to be preserved for long were written on the skin of deer instead of the paper. This skin was especially prepared for writing as a thin and fine parchment and was called رَقٍّ (raqq) terminologically. The Jews and Christians in general wrote the Torah, Psalms, the Gospels and the Prophets’ Books on this same raqq so that they would endure. Here, by Scripture inscribed is implied the same collection of the holy scriptures which the followers of the Book possessed. It has been described as unrolled because it was not extinct; it was read and one could easily find out what was written in it. 4. By the much-frequented House. According to Hasan Basri, the much frequented House implies the House of Allah, the Kabah, which is never without its visitors and pilgrims at any time of the day and night. However, Ali, Ibn Abbas, Ikrimah, Mujahid, Qatadah, Dahhak, Ibn Zaid and others are of the opinion that it implies the Bait-al-mamur (in Heavens) which the Prophet (ﷺ) referred to in connection with his Miraj (Ascension), against the wall of which he had seen the Prophet Abraham (peace be upon him) reclining. It is opined that just as the Kaabah is the center and place of refuge for all God-worshipers, so is there in every heaven a similar Kaabah for its dwellers which occupies a similar central position for the worshipers of Allah there. One of these Kaabahs was the one against the wall of which Prophet (ﷺ) had seen the Prophet Abraham (peace be upon him) reclining on the occasion of the Mairaj; with which Prophet Abraham (peace be upon him) had a natural affinity, for he was the first builder of the Kaabah of the earth. In view of this explanation, this second commentary does not go against the commentary given by Hasan Basri, but if both are read together, we can understand that here the oath has not been sworn only by the Kaabah of the earth, but it also includes an oath by all the Kaabahs that are there in the entire universe. The roof exalted (verse 5): the sky which seems to be spread over the earth like a vault; here this word has been used for the entire universe. Verse 6: Several meanings have ban given of the word al-bahril-masjur as used in the original. Some commentators have taken it in the meaning of full of fire; some take it in the sense of empty and unoccupied, the water of which might have sunk into the earth; some take it in the meaning of restricted and confined by which they imply that the ocean has been restrained so that its water neither sinks into the earth nor spreads over the land to drown all its dwellers. Some have taken it in the meaning of mixed and blended because in it sweet and saline, warm and cold, water is mixed together; and some take it in the meaning of brimful and surging. The first two of these meanings bear no relevance to the context. These two states of the ocean-splitting of the bottom of the ocean and sinking of its water into the earth and then its being filled with fire will appear on the Day of Resurrection, as mentioned in (Surah At- Takweer, Ayat 6 "when the seas shall be set boiling") and (Surah Al-Infitar, Ayat 3 "when the seas are made to burst forth,"). These states of the future do not exist at present and therefore cannot be sworn by to convince the people of today of the occurrence of the Hereafter. Therefore, here al-bahril-masjur can be taken only in the meaning of confined, mixed, brimful and surging. 7. Verily, your Lord's chastisement shall come to pass. 8. none can avert that. Verse 7: This is that truth for which an oath has been sworn by the five things. “The punishment of your Lord” implies the Hereafter, for it will be a torment for those who deny that it will come. That is why it has been called “the punishment of your Lord” instead of the Resurrection, or the Hereafter, or the Day of Retribution. Mount Toor is the place where a decision was taken to exalt an oppressed nation and to abase an oppressive nation, and this decision was taken not on the basis of a physical law but on the basis of a moral law and the law of retribution. Therefore, Mount Toor has been presented as a symbol for the Hereafter. It implies that the decision of exalting a helpless nation like the children of Israel and the drowning of a powerful and mighty ruler like the Pharaoh along with his hosts, which was taken in a quiet and lifeless night on the Mount Toor, is proof of the fact how the nature of the kingdom of the universe demands that man who has been endowed with powers and authority, should be subjected to moral accountability and rewarded and punished accordingly, and for meeting this demand adequately a Day of Reckoning is necessary when the entire mankind should be gathered together and called to account for its deeds. The holy scriptures have been sworn by because all the Prophets who came to the world from the Lord of the universe and the Books they brought gave the same one news in every age which the Prophet Muhammad (ﷺ) is giving, i.e. that all humans of the former and latter generations will one day be resurrected and presented before their God and rewarded and punished according to their deeds. Every heavenly Book proclaimed that this life is not the only life. And that, after death, man will not end up in the dust forever, and that there will be both accountability and reckoning. “The inhabited House” has been sworn by for the reason that in those days the building of the Kaabah was a great sign, particularly for the Arabs, which pointed to the truthfulness of Allah’s Prophets and to the fact that they were supported by Allah Almighty’s far-reaching wisdom and great power. 2,500 years before the revelation of these verses a person happens to visit these barren and uninhabited mountains, without any army or worldly provision, leaving behind a wife and a suckling child devoid of material support. Then, some time later the same man returns and builds at this desolate place a house for the worship of Allah and gives a call to the people to come and visit that house as pilgrims. For 2,500 years this House continues to remain such a sanctuary of peace that while blood is shed in the country around it, none can dare raise his hand against another as soon as people enter its sacred boundaries; and then because of this very House, Arabia is blessed with four months of such total peace every year when caravans travel in full safety, trade flourishes and markets are held. Then the House inspired such awe that during this whole period no tyrant could ever look towards it with an evil intention, and whoever dared do so was so seized by Allah’s wrath that he became an object of warning for others. Such a miracle had been witnessed by the people themselves only 45 years before the revelation of these verses, and many of those who had witnessed it were still present and living in the city at the time when these verses were being recited to the people of Makkah. What greater proof could be there of the fact that the Prophets of Allah never uttered empty words? When men of such caliber have unanimously been giving in every age the news that Resurrection shall occur and accountability shall take place, it would be sheer madness to dub it as the bragging of the insane. The exalted roof (the sky) and the surging ocean have been sworn by, for both of these are a pointer to Allah’s wisdom and His power, and the same wisdom and power prove both the possibility of the Hereafter and its occurrence and necessity. As for the ocean, anyone who considers it deeply with an unbiased mind will testify that the provision of water in such abundance on the earth is by itself such an amazing work which cannot be the result of an accident or chance. Its water has been made saline so that the bodies of the millions of the animals which die in it daily do not rot. Its water has been restrained at a particular level in such a way that it neither sinks into the earth’s belly passing through its cracks and holes, nor it spreads over the land to submerge it, but has been checked at the same level for millions of years. Because of the existence of this great store of water the rainfall is arranged on the dry parts of the earth, in which the heat of the sun and the circulation of the winds cooperate with full regularity. Then the ocean’s being inhabited with life and the creation in it of the various kinds of creatures has given man the advantage that he obtains from it his food and other necessities in large quantities. Then its being checked and restrained to a limit has given birth to the continents and islands which are the home of man, and became of its adhering to and following some fixed laws has it become possible that man may navigate his ships in it. Such an arrangement could not have possibly existed without the wisdom of an All-Wise Being and the power of an Absolute Ruler. Now, if this is undeniable evidence that an All-Wise and All-Powerful God has also created a vast and surging, brackish ocean besides making countless other arrangements for the purpose of settling man on the earth, then that person would be foolhardy, who expects that the All-Wise God would make arrangements for man that he should water his crops from the ocean and provide him sustenance thereby but would never question him as to how he returned thanks after eating His provisions. And that He would grant man the power that he should run his ships on the surface of the ocean but would never question him as to whether he had run the ships for the sake of the truth, righteousness and justice, or had committed robberies. Likewise, it would also be sheer folly to imagine that the Absolute Sovereign, Who has checked and restrained this vast store of water on this suspended globe which is moving in space, Who has dissolved a huge quantity of salt in it, Who has created countless varieties of creatures in it, and has arranged their sustenance therein, Who carries billions of tons of water from it every year by means of the wind and causes it to fall regularly as rain on millions of square miles of dry land, becomes so helpless and powerless after creating man that He could not resurrect him again. In the verse 9 below, the word '"maur" is used for turning round, boiling, fluttering, rotating, swinging and moving forward and backward. The object of depicting the condition of the heavens on the Day of Resurrection in these words is to give the idea that the system of the heavens on that Day will be wholly upset, and when an observer will look up to the sky, he will feel that the constant pattern and order that it always used to present, has been broken and there is disorder, confusion and chaos on every side. 9. (It shall come to pass) on the Day when the heaven will convulse in a great convulsion, 10. And the mountains will fly hither and thither. 11. Then woe that Day to those that treat (Truth) as Falsehood 12. and amuse themselves with vain argumentation. Verse 12: It means that they are mocking and ridiculing the news of Resurrection, Hereafter, Heaven and Hell when they hear it from the Prophet (peace be upon him), and instead of considering it seriously they are disputing it only for fun and amusement. Their discussions of the Hereafter are not meant to understand the reality, but only to amuse themselves, and they do not at all realize the fate for which they arc destined. 18. enjoying what Allah will have endowed them with; and their Lord will have saved them from the torment of the Blazing Fire. Verse 18: There seems to be no need to mention a person’s being saved from Hell after it has been said that he will be admitted to Heaven, but at several places in the Quran these two things have been mentioned separately because a person’s being saved from Hell is by itself a great blessing. And the words, “and their Lord saved them from the punishment of Hell”, is an allusion to the truth that man’s being saved from Hell is possible only through Allah’s grace and bounty; otherwise human weaknesses cause such flaws to occur in everyone’s work that if Allah does not overlook them by His grace and instead decides to subject him to accountability, none can save himself from His punishment. That is why although entry into Paradise is a great bounty from Allah, his being saved from Hell is no less a mercy. 19. (To them will be said:) "Eat and drink ye, with profit and health, because of your (good) deeds." 20. They will recline (with ease) on Thrones (of dignity) arranged in ranks; and We shall join them to Companions, with beautiful big and lustrous eyes. 21. We shall unite the believers with those descendants of theirs who followed them in their faith, and shall not deny them any part of the reward for their good deeds. Every person is pledged to what he did. Verse 21: If the children had been following in the footsteps of their forefathers in faith, they will be joined with them in Paradise even though they might not deserve, on the basis of their deeds, the same high rank which the elders would attain on the basis of their superior faith and deeds, and this joining will not be of the nature of occasional visits and meetings but they will be lodged permanently with them in Paradise as is borne out by the words: alhaqna bi-him. For the sake of further satisfaction it has been stated: In order to be joined with their offspring the parents will not be lowered and reduced in rank, but in order to be joined with their elders the rank of the children will be enhanced and exalted. The last word of the verse 21 the metaphor of " رَهِيۡنٌ‏" rahn (pledge) is very meaningful. If a person takes a loan from somebody, and the creditor keeps some article belonging to the debtor with himself as a guarantee for the payment of his right, the debtor cannot redeem his pledge unless he pays off the debts; and if he does not redeem his pledge within the fixed time limit, the pledged article stands forfeited. The nature of the affair between man and God has been compared here to this very situation. The provisions, powers, capabilities and authority that God has granted man in the world are a debt that the Master has given to His servant, and as a guarantee for this debt the self of man is a pledge with Allah. If man by employing the provisions and the powers and authority in the right way earns the good by which the debt can be paid off, he will redeem the pledged thing, i.e. his own self, otherwise it will be forfeited. This thing has been said immediately after the preceding verse because even though the righteous believers may themselves be the people of a very high rank, their children cannot redeem their pledge unless they redeem their self by their own labor and effort. The earning of the forefathers cannot redeem the children. However, if the children are able to redeem themselves by virtue of their faith in some degree by following their righteous forefathers in their footsteps, it would then be Allah’s grace and bounty that in Paradise He may exalt them from lower ranks to be joined with their parents in the higher ranks. The good done by the forefathers can benefit the children only so far, but if by their own deeds they deserve Hell, it is not possible that they may be admitted to Paradise for the sake of the forefathers. Another thing that can be deduced from this verse is that the less righteous children’s being joined with their more righteous forefathers is not in reality the result of the lifework of the children but of their forefathers’. They by virtue of their deeds will deserve the grace that their children be joined with them in order to be a comfort of the eyes for them. That is why Allah will not lower their ranks to join them with their children but will exalt the children’s ranks to be joined with them, so that the perfection of Allah’s blessings on them is not marred by the distress that they may suffer on account of the remoteness of their children far away. 22. And We shall bestow on them, of fruit and meat, anything they shall desire. 23. They shall there exchange, one with another, a (loving) cup free of frivolity, free of all taint of ill. 24. Round about them will serve, (devoted) to them. Youths (handsome) as Pearls well-guarded. 25. They will advance to each other, engaging in mutual inquiry. 26. They will say: "Aforetime, we were not without fear for the sake of our people. 27. "But Allah has been good to us, and has delivered us from the Penalty of the Scorching Wind. 28. "Truly, we did call unto Him from of old: truly it is He, the Beneficent, the Merciful!" In the second section (verses 29-49) the Quraish chiefs' attitude towards the message of the Holy Prophet (peace and blessings of Allah he upon him) has been criticized. They called him a sorcerer, a madman, or a poet, and would thus mislead the common people against him so that they should not pay any serious attention to the message he preached. They looked upon him as a calamity that had suddenly descended on them and would openly wish that he met with a disaster so that they were rid of him. 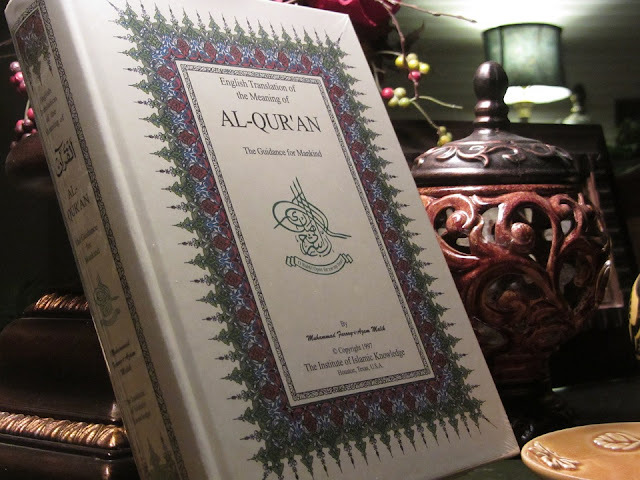 They accused him of fabricating the Qur'an by himself and of presenting it in the name of Allah, and this was, God forbid, a fraud that he was practicing. They would often taunt him, saying that God could not have appointed an ordinary man like him to the office of Prophet-hood. They expressed great disgust at his invitation and message and would avoid him as if he was asking them for a reward for it. They would sit and take counsels together to devise schemes in order to put an end to his mission. And while they did all this they never realized what creeds of ignorance they were involved in and how selflessly and sincerely was Muhammad (peace and blessings of Allah be upon him) exerting himself to deliver them from their error. While criticizing them for this attitude and conduct, Allah has put them certain questions, one after the other, each of which is either an answer to some objection of theirs, or a criticism of some error. Then, it has been said that it would absolutely be of no avail to show them a miracle in order to convince them of his Prophet-hood, for they were such stubborn people as would misinterpret anything they were shown only to avoid affirming the faith. 29. Therefore proclaim thou the praises (of thy Lord): for by the Grace of thy Lord, thou art no (vulgar) soothsayer, nor art thou one possessed. 30. Or do they say:- "A Poet! we await for him some calamity (hatched) by Time!" 31. Say thou: "Await ye!- I too will wait along with you!" 32. Is it that their faculties of understanding urge them to this, or are they but a people transgressing beyond bounds? 33. Or do they say, "He fabricated the (Message)"? Nay, they have no faith!34. Let them then produce a recital like unto it, If (it be) they speak the truth!35. Were they created of nothing, or were they themselves the creators?36. Or did they create the heavens and the earth? Nay, they have no firm belief. Verse 37 is an answer to the objection of the disbelievers of Makkah who said: Why had Muhammad (peace be upon him), son of Abdullah, only been appointed a Messenger? 37. Or do they have your Lord's treasures in their keeping? Or have absolute authority over them? The answer implies this: Somebody in any case had to be appointed a Messenger in order to deliver the people from their error of serving others than Allah. Now the question is: Who should decide whom Allah should appoint His Messenger and whom He should not? If these people refuse to accept the Messenger appointed by Allah, it means that either they regard themselves as the masters of the world or they presume that the world may belong to Allah, but it should be ruled by them. 38. Or do they have a ladder whereon they can climb and attempt to listen (to what is transpiring in the Higher Realm)? Then, let any of them who has listened to it produce a clear proof of it. 39. Or has He only daughters and ye have sons? In verses 38 and 39 a detailed reasoning has been compressed into these brief sentences. It means to say: If you deny what the Prophet (peace be upon him) says, then what other means do you have to know the reality? Has any of you had access to the heavens where he found out directly from Allah or His angels that the beliefs on which you have based your religion are absolutely in accord with the reality? If someone makes this claim, he should come forward and tell as to when and how he had access to the heavens and what knowledge he has brought from there. If you do not make any such claim, then consider how ridiculous is your creed that you assign children to Allah, Lord of the worlds, and that too daughters, whom you regard as disgraceful for yourselves. Without knowledge you are wandering in the darkness of such errors and turning hostile to the person who brings to you the light of knowledge from God. 40. Or is it that thou dost ask for a reward, so that they are burdened with a load of debt?41. Or that the Unseen in it their hands, and they write it down? In verse 42, the allusion is to the secret plots that the disbelievers of Makkah used to devise in their meetings in order to defeat the mission of the Prophet (peace be upon him) and to kill him. 42. Or are they contriving a stratagem against you? If so, that stratagem will rebound against the unbelievers. This is one of the clear prophecies of the Quran. In the initial stage at Makkah when the Prophet (ﷺ) had no apparent power and support with him except a handful of the ill-equipped Muslims and the whole nation was opposing and resisting him relentlessly, the confrontation between Islam and disbelief appeared to be utterly unequal. No one at that time could imagine that after a few years the tables would be turned on disbelief. Rather, the superficial observer could safely predict that the strong opposition of the Quraish and entire Arabia would at last put an end to the message of Islam. But even under those conditions, a challenge was thrown to the disbelievers and they were told in clear terms: You may devise whatever plots you wish in order to frustrate this message, they will all recoil upon you, and you will never succeed in defeating and putting an end to it. The verse 44 is meant to expose the stubbornness of the Quraish chiefs on the one hand; and to console the Prophet (peace be upon him) and his companions, on the other. The Prophet (peace be upon him) and his companions wished that those people should be shown such a miracle by Allah as should convince them of the truth of his Prophet-hood. At this, it has been said: Whatever miracle they might see with their eyes, they will in any case misinterpret it and invent an excuse for persisting in disbelief, for their hearts are not at all inclined to believe. At several other places also in the Quran their this stubbornness has been mentioned, e.g. in (Surah Al-Anaam, Ayat 111), it has been said: Even if we had sent down the angels to them and made the dead speak to them and ranged all the things of the world before them (as a proof thereof), they would still have disbelieved, and in( Surah Al-Hijr, Ayat 15): Even if We had opened a gate for them in heaven, and they had begun to ascend through it during day time, they would have said: Our eyes have been dazzled; nay, we have been bewitched. 45. So leave them alone until they encounter that Day of theirs, wherein they shall (perforce) swoon (with terror), 46. The Day when their plotting will avail them nothing and no help shall be given them. 47. And verily, for those who do wrong, there is another punishment besides this: But most of them understand not. 48. Now await in patience the command of thy Lord: for verily thou art in Our eyes: and celebrate the praises of thy Lord the while thou standest forth, 49. And for part of the night also praise thou Him,- and at the retreat of the stars! As can be noticed that In the beginning of second section as well as in its end, the Holy Prophet (peace and blessings of Allah be upon him) has been given the instruction that he should persistently continue giving his invitation and preaching his message in spite of the accusations and objections of his opponents and enemies, and should endure their resistance patiently till Allah's judgment comes to pass. Besides, he has been consoled, as if to say "Your Lord has not left you alone to face your enemies, after raising you as a Prophet, but He is constantly watching over you. Therefore, endure every hardship patiently till the Hour of His judgment comes, and seek through praising and glorifying your Lord the power that is required for exerting in the cause of Allah under such conditions.